Somehow, NaNoWriMo is sneaking up on me. It’s National Novel Writing Month. It always starts on November first and ends on November thirtieth, so I should be able to see it coming, shouldn’t I? Yet here I am, on October twenty-ninth, totally unprepared. I don’t have an outline. I don’t have a plan. I don’t even have a supply of appropriate snacks. I do, of course, have a good supply of my favorite coffee. I’m not a complete slacker. Some things cannot be left to chance. If I’m going to participate in NaNoWriMo, I must have enough coffee to float a small armada. That “if” ought to mean I have a choice. I don’t really have to write fifty thousand words in the month of November. No one is holding a gun to my head. Theoretically, I could decide not to do it this year. I’ve done it twice. I’ve won it twice. I could give myself a break. I wonder why I can’t imagine doing that. NaNoWriMo is hard. I have lots of other things to do in the month of November. I need to fill a tie-dye special order that involves four different color palettes. I need to get my house clean enough to host a family gathering on Thanksgiving. I have to make stuffing and yeast rolls and fifteen or sixteen pies. Why do I take on the added challenge of writing at least one thousand six hundred and sixty-seven words a day, when I don’t even have a plan? I’m hooked, that’s why. I’m hooked on the camaraderie. I’m hooked on the November first kick-off latte, the excited first-week word sprints and the horrible second-week doldrums. I’m hooked on the pep talks, the word count updates, and the plot bunnies. I’m hooked on the traveling shovel of death. I have tasted the adrenaline-laced word frenzy that is National Novel Writing Month and I can’t give it up. If you’ve managed to avoid NaNoWriMo until now, there’s still hope for you. You can have a November free of late night typing fests and frantic word count updates. You can spend your November evenings doing jigsaw puzzles or playing Monopoly. You can eat leftover Thanksgiving pie and watch Emmet Otter’s Jug-band Christmas on Black Friday without worrying about catching up on two days worth of word count. It’s too late for me but you can still save yourself. Run! It’s almost upon you! Or you could go to nanowrimo.org and join us. Come on, you know you want to. All the cool kids are doing it. This entry was posted in Uncategorized and tagged NaNoWriMo, procrastination, writing on October 29, 2014 by releaf1954. Well, here I am, back in flat Florida and I never got a chance to paint while I was in North Carolina. The weather was only completely clear one day while we were there and we spent that day cruising the Blue Ridge Parkway, admiring the beautiful leaves. There was no time to set up in one place for hours and paint. I will keep that on my wish list for another trip. I did paint today, though, and there is a North Carolina connection. We never go to North Carolina in October without visiting an apple orchard. Sometimes we visit more than one. This time, we went to our favorite, Justus Orchard in Hendersonville. We picked out a half-bushel of apples, a mixture of Arkansas Black, Mutsu and Pink Lady. I like my apples crisp and tart. This morning, I took one of each and put them on a plate. I put the plate on a yellow cloth and then I painted my little still life. I like it. The green one is the Mutsu. You can probably figure out the other two. While I was in the middle of painting this, my older daughter called. She wanted to come over and do some laundry. She wanted to bring my grandsons with her so we could do some thrift store shopping later. Thrift stores are great for finding inexpensive costume elements. Halloween is only nine days away, after all. I agreed to pick her up, but I told her I was in the middle of a painting and I needed to get right back to it as soon as we returned to my house. Fortunately, they only live five minutes away. My grandsons were kind enough to leave me alone while I finished my painting. Then the younger one said he would like to paint, too. I offered him one of my itty bitty canvases, but he said he would rather have a “medium” one, meaning one the size of my apple painting. 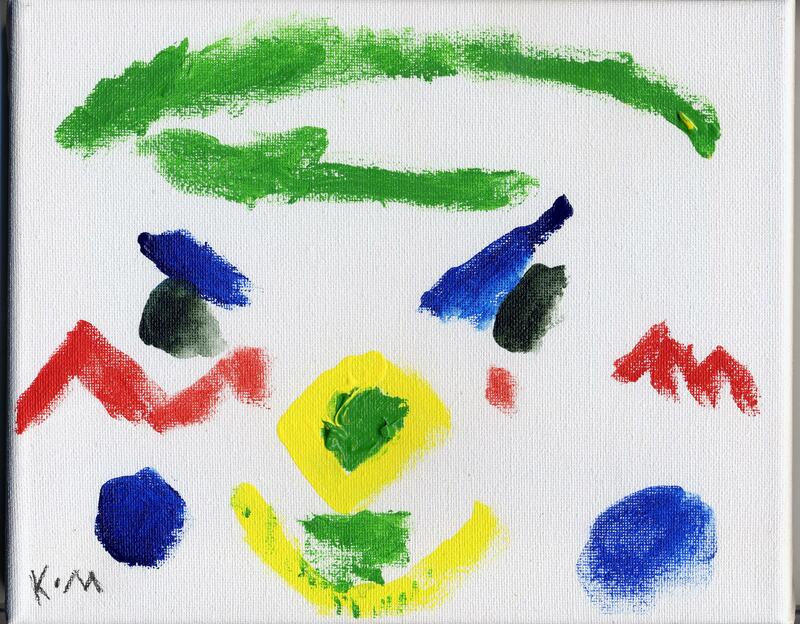 I found him an 8” x 10” and let him use the paint left on my palette. He’s in a Halloween mood, so it’s a bit creepy, but I think it also has an innocent charm. He likes the pthalo blue as much as I do. He’s six years old, so he’s getting an early start with the fine art supplies. This particular grandson is the first person (besides myself) to own one of my paintings. He asked me for one months ago and chose my itty bitty snowman painting that I made when I went to North Carolina in March. He put it in his bedroom, near his pillow, to keep nightmares at bay. It makes me happy to know my little snowman is watching over him. We went pumpkin shopping and thrift store shopping in the afternoon. 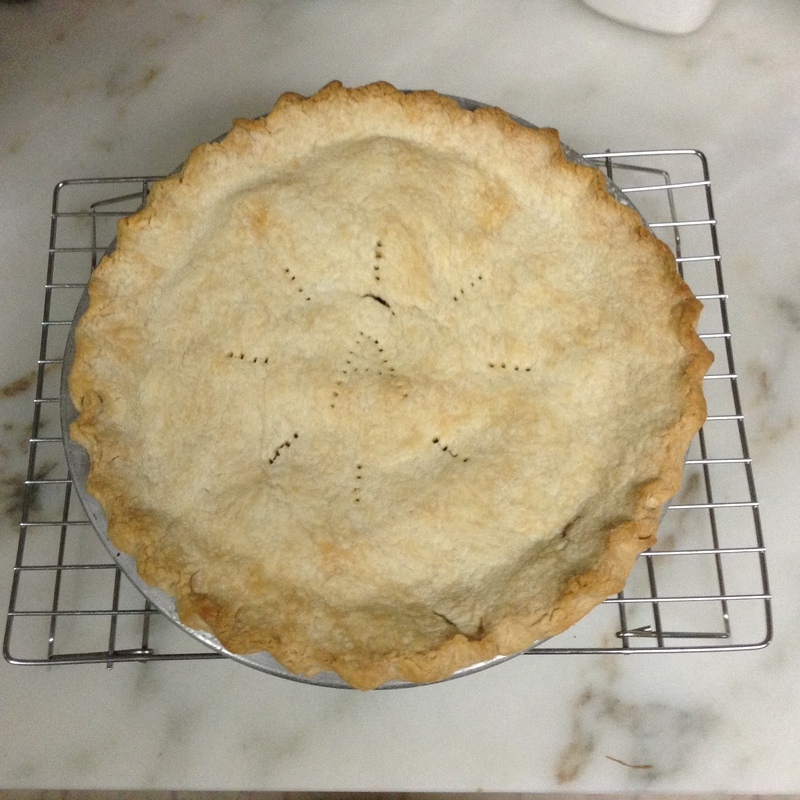 I took them home when the laundry was all done and then I gathered the apples from my still life, plus a few more, and I made an apple pie. I painted, I spent time with my grandsons and I baked. This has been a good day. 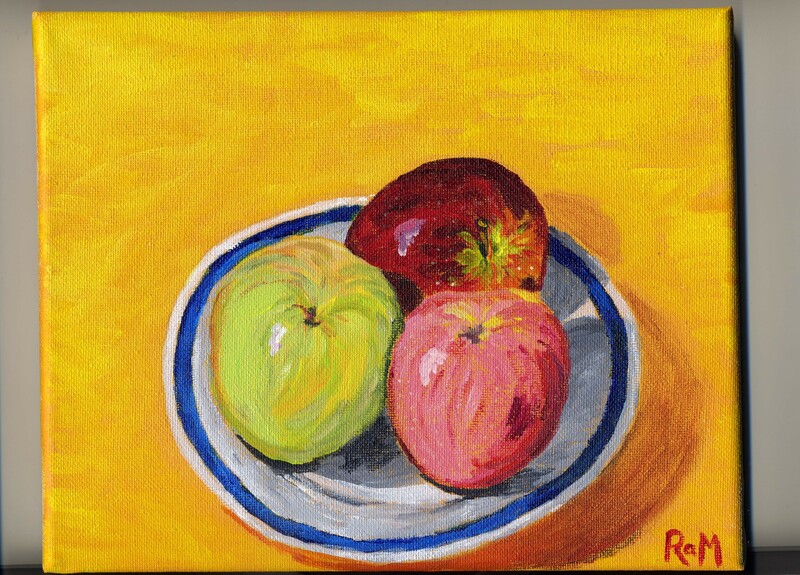 This entry was posted in Uncategorized and tagged apple pie, apples, baking, North Carolina, painting on October 22, 2014 by releaf1954. I am on vacation and I should be able to give myself a special dispensation to skip this week’s blog post but, darn it, a commitment is a commitment. It’s Wednesday and I will post something. If anyone has been hoping I might write something short and sweet that won’t take long to read, this is your lucky week! 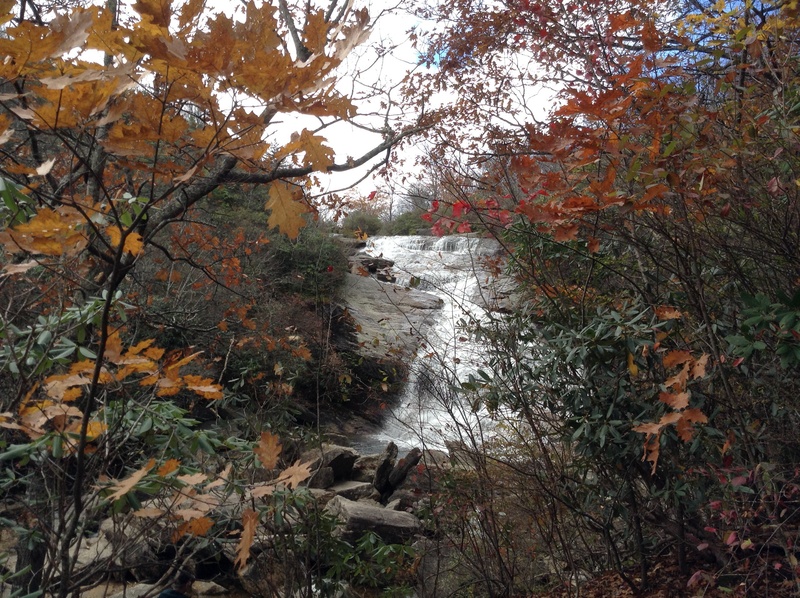 I brought my paints with me but I haven’t had a chance to spend time painting, which is a shame because Autumn in North Carolina is the one thing I most want to paint. I have done a couple of small drawings, just to keep my hand in. It’s amazing to me how doing even one small drawing opens up my mind and heart. It’s really going to be hard to return to flat Florida. 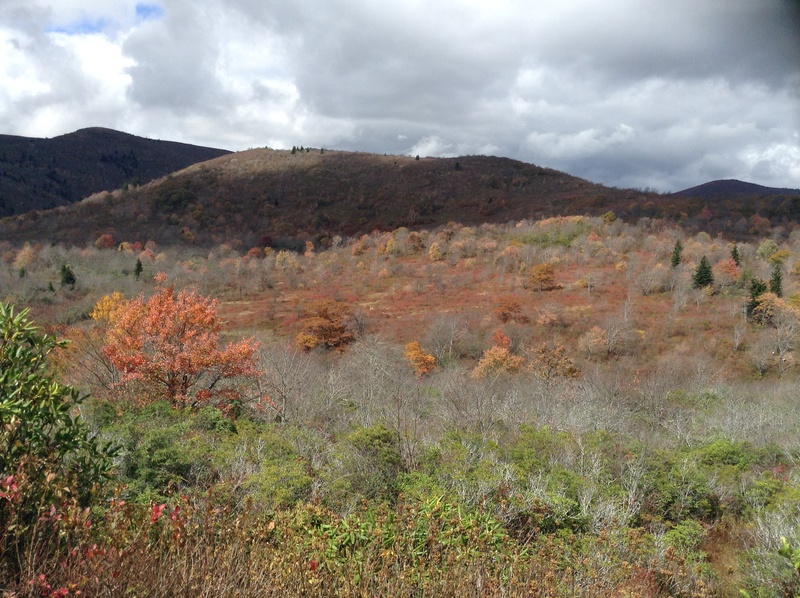 This entry was posted in Uncategorized and tagged Blue Ridge Parkway, Graveyard Fields, North Carolina on October 15, 2014 by releaf1954. Today is Wednesday, October 1, 2014. All performer applications for the 2015 Florida Folk Festival must be postmarked by today to be considered. I have been performing at this event since 1971 and I still find the application process intimidating. Back in those days, my mom was the contact for the family yodeling act, so I had no idea how intimidating the application could be. My Mom is gone now, but we still have five family members who want to perform at the Florida Folk Festival. Somehow, everyone agreed that I would be the new contact. They say it’s because I’m the one who lives in Florida year-round, which really makes no difference, since I can’t complete the application without contacting all the other group members, no matter where they’re living. That’s the first thing I do once I realize it’s time to fill out the application. That gets a little tricky, because the e-mail address the festival organizers have is the one for the family act and it almost never gets any e-mail. I forget to check it. There is also the past history of the application process to trip me up. In recent years, the poor woman who has to organize the event has had way too much on her plate. The applications went out late and consequently, the application deadline was extended well beyond October first. I should have been paying attention. I should have been checking that e-mail, but I just didn’t realize time was getting away from me. If you are a regular follower of this blog, you know that my own plate has been a bit overloaded lately. You also know that some days, I’m just not very good at coping. I hide out and avoid stressful things until I feel better. The Florida Folk Festival application is a very stressful thing. This year, someone took something off the festival organizer’s plate and she sent out the applications on August first. I wasn’t checking the family e-mail, so I failed to notice. My sister woke me up to the deadline after attending a meeting in the town that hosts the event. That was a couple of weeks ago. I should have jumped on that application as soon as I heard from her, but I found myself procrastinating. I had good excuses, including two memorial services to attend during that time frame. Still, the biggest reason I procrastinated is that the application process stresses me out and I just couldn’t face it. I know. Believe me, I know. It would be a lot less stressful if I would just open up the application as soon as I know it’s there and start filling it out. I do know, but I still procrastinate. I had to gather information. Would all the regular participants be planning to attend this year? Would they be bringing the same guests they brought last year? Were my sister’s granddaughters ready to join us this year? These are the important questions I sent out via Facebook messages and I did nothing at all until I heard back from everyone. Well, I did a couple of things. I breathed and I waited. I needed to do those things before I could face that application. Then the messages were answered and I had no more excuses. That’s when the panic hit. I downloaded the application and saw that we needed a new recording this year. We didn’t have a new recording. More Facebook messages were sent. More procrastination occurred as I waited for my sisters and my younger daughter to tell me they didn’t have any recordings, either. I scoured my files again. I found something that would work, but I needed to get it on a CD and I’m technologically challenged. My older daughter saved the day. She put two songs on a CD for me. I folded up the application, tucked the CD inside and put it all in a padded envelope. I sealed the envelope. Yay! The application was ready to mail. I decided I could get some rest and mail it in the morning. That was last night. This morning, I realized I had never actually listened to the CD to make sure the recording was successful. I tore open the padded envelope, pulled out the CD and popped it into the nearest player. Yes! It worked. Then I popped it into a different player, because the application had asked me to do that. It worked there, too! Whew! I addressed a new envelope and sealed the application and CD inside. Then I drove to the Post Office and stood in line to mail it. I explained how important the postmark was and the nice postal worker stamped it twice, in different places, just to make sure. A great weight is off my shoulders – at least until I check the tie-dye e-mail. Performer applications went out on August first. Vendor applications were scheduled to go out October first. I did paint while I was procrastinating. 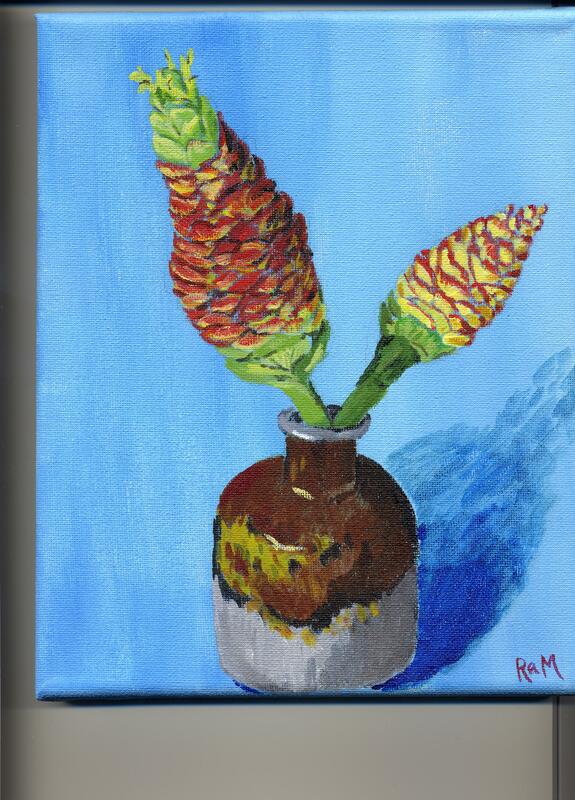 It’s two pine cone lilies in a handmade vase. We know it’s Autumn in Florida when the pine cone lilies turn red. This entry was posted in Uncategorized and tagged creativity, Florida Folk Festival, music, painting, procrastination, yodeling on October 1, 2014 by releaf1954.